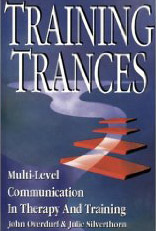 Training Trances Multi-Level Communication In Therapy And Training John Overduf & Julie Silverthorn. Training Trances is about how to therapeutically communicate with the unconscious mind. The authors present their own unique integration of Ericksonian techniques, traditional models of hypnotherapy, and recent research in related areas. Numerous new patterns modeled from the work of Milton H. Erickson, M.D. are clearly explained and demonstrated. The use of trance in training design, to unconsciously install the skills being taught to the participants, is also covered. The book developed from transcripts of a four day workshop, and the design of the book parallels the design chosen for the training itself. Individual exercises or those done in groups of two or three are offered so that the reader may practice the techniques and learn the skills. There are numerous "live" demonstrations, inductions, and double inductions which create for the reader a real "feel" of how hypnosis is done and which are also a rich source for linguistic analysis for the advanced reader. Written with insight and humor, this book's most unique twist is its use of multi-level communication and hypnotic language to create a "training trance" for the readers as they journey through the text. Some hypnotic references are obvious and explicit -- those which are not obvious will create enjoyable "ah-ha!" experiences for the reader as they are discovere.